“Lord, make me an instrument of Thy peace. Where there is hatred, let me sow love; where there is injury, pardon; where there is doubt, faith; where there is despair, hope; where there is darkness, light; and where there is sadness, joy. Pope Francis is the first Jesuit pope and the first Francis ever, and took his name in honor of St. Francis of Assisi of Italy. He is the first pope born outside of Europe since 741 AD and came from the Southern Hemisphere and the Americas. Before he became pope, he was a cardinal in Argentina. So far, Pope Francis’ time as leader of the Catholic Church has shown the whole world who he is in action: he acts with humility and supports of the world’s poor and marginalized people of ALL FAITHS, and he has been involved actively in areas of political diplomacy and environmental advocacy; he has supported the GBLT community. For me, he is an example of the best of our humanity. In mid March this year, through the pope, his American representative, Bishop Paul Tighe showed up at the South by Southwest Festival in Austin, TX where, the bishop spoke about how the pope and his message is becoming active in Social media around the planet. This is from a 3/19/17 show from NPR.org. This is an active way that Pope Francis puts out the message of the power of LOVE. 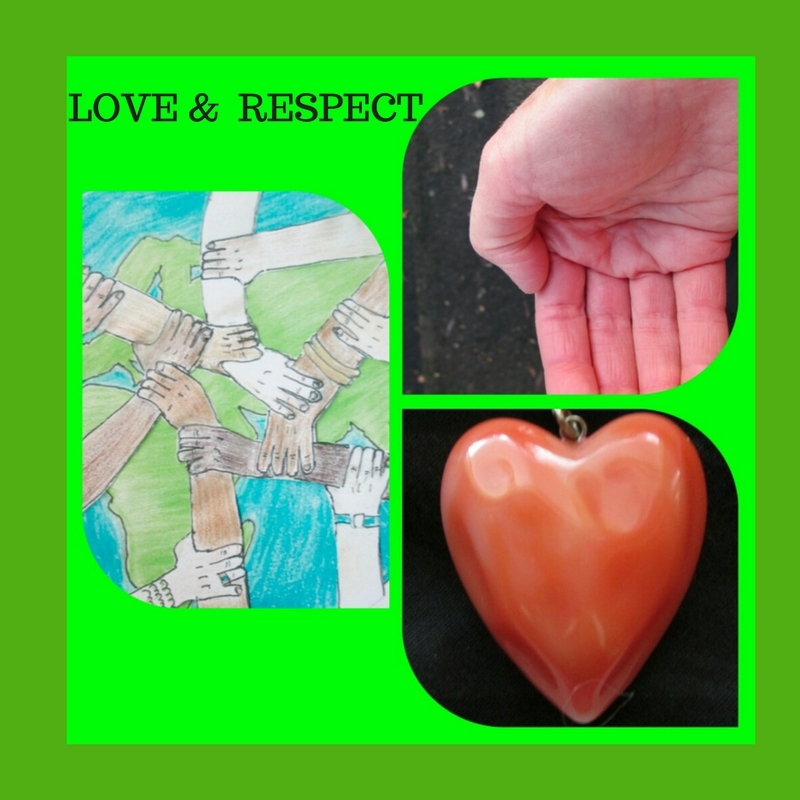 What does the present pope have to do with ME loving and respecting myself? I don’t know about you, but having a human being on the planet who acts as Pope Francis does, gives me hope. He inspires ME to do the next RIGHT thing and be the BEST of myself, not the most petty and selfish, self. I need a good role model who speaks about love and lives from that place. I don’t have to be Catholic to look up to him. I can follow him on TWITTER and feel better each day! Finally today, writing this blog I became a follower of Pope Francis on 4/9/17. It is NOT necessary for me to retweet everything he says, nor believe everything he says, but the spirit of what he says can live through me particularly since I do believe in a higher source in my life, and the Pope’s words help and remind me to be KINDER and more LOVING, more RESPECTFUL towards everyone. Those are VIBES that THIS Planet needs, and I need to be putting out in the world towards MYSELF and others. Thank you, Pope Francis, for showing me in action how I can be more loving and respectful of myself and everyone. Let me wear my heart on my sleeve and care about myself and others. Sometimes, I can NOT watch or listen to every horrific thing happening on this planet, but I can send LOVE to those who are suffering and dying without having to know all of the gruesome details about what is happening. I can use this Pope Francis’s actions as a way to emulate how to be in the world and be a happier, more respectful, more loving me! And I can seek solace in Pope Francis’ tweets and know that I am not ALONE in thinking this way, and that there are MILLIONS of other world citizens who feel the same or similar to me. I leave you with this beautiful song by Garth Brooks: “We Shall Be Free”, which was written after the Watts Riots in Los Angeles in 1992. Recently where I live we had an ice storm. 2/10 of an inch or more of ice caused some havoc with electrical outages where I live. The aftermath of that storm also left some trees which had lost a few small branches, or lost major branches, or were even uprooted. Those trees that could bend under the weight of the ice survived with almost no loss of limbs. 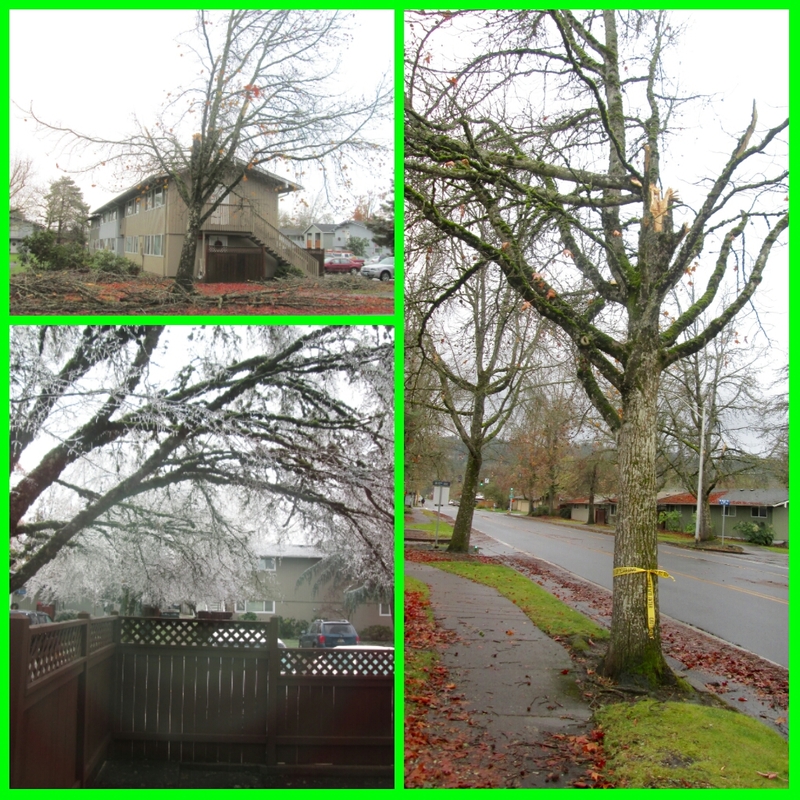 The pruning by nature took place in the whole area where I live, but how severely each tree withstood the ice storm varied greatly. I believe this metaphor also works for all people including myself. During my life there have been times when I needed to prune my own dead wood. What I mean is, I needed to change or transform ways of thinking and doing things, or habits of thinking that had not worked in my life. When I did not prune those habits, I made poor choices of people and things in my life that did not serve me. I learned this kind of behavior in my own family. Once I finally became a parent in my 30s, I found out what a challenge it was to rear a child. I had one child. However, I was one of five children. All of my siblings and I were born close together, 5 children in 7 years. Since I was number four, I was glad to be born, but great challenges were part of my childhood. My parents did the best they could. My mom had to do much of our rearing alone with the help of my grandmother because my dad had a job that was many miles from the home my father built for us. My mother had it hard trying to give all of us the attention we needed. From these beginnings, I learned some not great habits. One of them was I had a poor self esteem. That hindered the choices that I made of people who I made important in my life. I did not know how I needed to be treated. I also was a people pleaser, which was not helpful to myself because I was clueless about how I felt about what I honestly wanted. I was not seeing “my part” in my own life. I had nearly no boundaries for myself, so that I was taking on other peoples’ issues without knowing it, and not acknowledging my own issues. This kind of dead wood I did not know I needed to prune until later in my life. There have been consequences to me and others I love because of the choices I have made, and particularly after I became an adult (in age) and lived on my own. My first pruning and personal ice storm came after I was divorced in my mid 30s. I am thankful that I became a more reflective person after that time. I started to look at what “my part” was that may have contributed to the end of that marriage. After a year or so after the divorce, I started to feel happier and freer because I realized I had an opportunity to find my own profession, and learn who I am. (I had married at 20 years old.) I also did not want my divorce to become some kind of anchor that I dragged through my life as some personal failure or shame. At the same time, I did need to be honest about what had happened to me during that marriage and not dismiss my own feelings about it, and, importantly, I had to summon courage to face some parts of myself that I was not happy with. For me this process of pruning has taken a long time. The way I grew up, I rarely knew what I honestly felt or wanted. These were habits that I “lived” for years that I needed to prune and overcome, and I am still learning to ask myself how I feel each day. I am finally learning what boundaries actually are between myself and others. I am still thankful for that first ice storm of a divorce that happened many years ago because it started the process for me to begin to reflect on a deeper level about myself and my life and to learn who I AM. I wrote this poem more than 10 years ago. I can’t even remember what triggered me to write it. It may have been when my father died 13 years ago. For our father’s attention…. approval? How do we get past the suffering? How do we shed the pain? To feel emotionally disconnected once again. In an endless stream of repetition. When we were merely kids. Embrace, comfort, and protect your needy child. Love and care for her/him. And be filled with light and lightness. To let go of and live. This year has taught me that after my mother died in October, that she was the source of LOVE and goodness in my family. The needy child that I have had in me did not fully see who my mother was and that she was unable physically and was too overwhelmed to LOVE me as much as my needy child wanted during my childhood. Now she and I are both free and I have pruned away that false expectation and perception of whether my mom loved me or not forever. These days I am also learning to be more compassionate of myself, as I do all this pruning of dead wood. When I have been afraid, I can NOT think straight. I feel I have no possibilities, or I feel helpless and hopeless. When I can become vulnerable enough and admit my fear and notice why I am afraid, then I can work to tell the truth to myself or others about my fear(s). Then I am free again and can notice other possible ways to deal with a situation or challenge than when I was blinded by my fear. I was going through this process the few last weeks. This was not an instant process. It took me some time to unravel it. I also had to ask for help from my source. After I did this, I calmed down and was able to more patiently navigate my way through my recent and even ongoing challenges. I found a possible solution that I was unable to even fathom when I had been so fearful. I have noticed that when I am fearful, I am also less loving and empathetic. I am quicker to anger. Over the last few months, with all of the mass shootings, shootings of African Americans, and police officers and unrest and shootings around the world, I have resisted going to fear, but it crept in anyway. Denying it was there was not helping. Also I have been disturbed and saddened by the hate I have witnessed against all groups of people. Hate has an energy that is palpable and very dark. However, I and we humans have a way to conquer hate and fear, and that is with love and empathy. Therefore, in the presence of the energy of LOVE, hate is conquered. Getting to this place of LOVE is definitely not automatic for me. What I can do, is begin with myself. I need to begin with being kinder and more loving to myself, only then can I give love or at least have empathy for others. First, I have to shift and acknowledge my fear or anger if I have any. Recently, I found what was under my fear was a very old resentment, which I needed to admit to myself. This included that I needed to become willing to be an observer of my own actions, emotions, and triggers. My source helps me to see what those are when I become willing to be humble and listen from a place of silence. I am no saint. I am aware I need all the help I can get, so I ask or pray for it. I just saw this this Tuesday. This young man shows what LOVE and EMPATHY are in his unbelievable rap. Don’t miss it! Keep kleenex handy. Sorry, initially I copied and pasted the wrong rap! The interconnected and inner connected web of life is something I love to witness. While I was photographing the spider web on the left of this photo-montage, the squirrel in the middle photo was watching me. I believe this might be the same squirrel which welcomed me home last October. He appeared in another blog “Being Welcomed”. I was so happy my squirrel friend was curious about what I was doing. I feel a friendly connection with the squirrels where I live. That is just one way I experience how I am connected to everything else. While I was teaching English-as-a-Second-Language to people from all over the world, not only did I teach English, but through my students, I began to learn and feel how connected all of us humans are. Yes, we have our differences, but we have so many common needs and human problems. I was fortunate to learn, first hand, how similar all of us humans are. I do not claim to fully understand quantum physics, but I “grok” a sense of it. In a way, it helps me to “get” this idea of inner connectedness. It helps remind me to include all people, animals, insects, and things on our planet. We may see ourselves as separate with our eyes, but at a cellular and automic level, that is not TRUE. I also wonder whether this connects us all to what I call my source. I find this also hints at what Sitting Bull is calling “through mysterious power”. For me, this has also become a visceral feeling of inner connection to all that is. 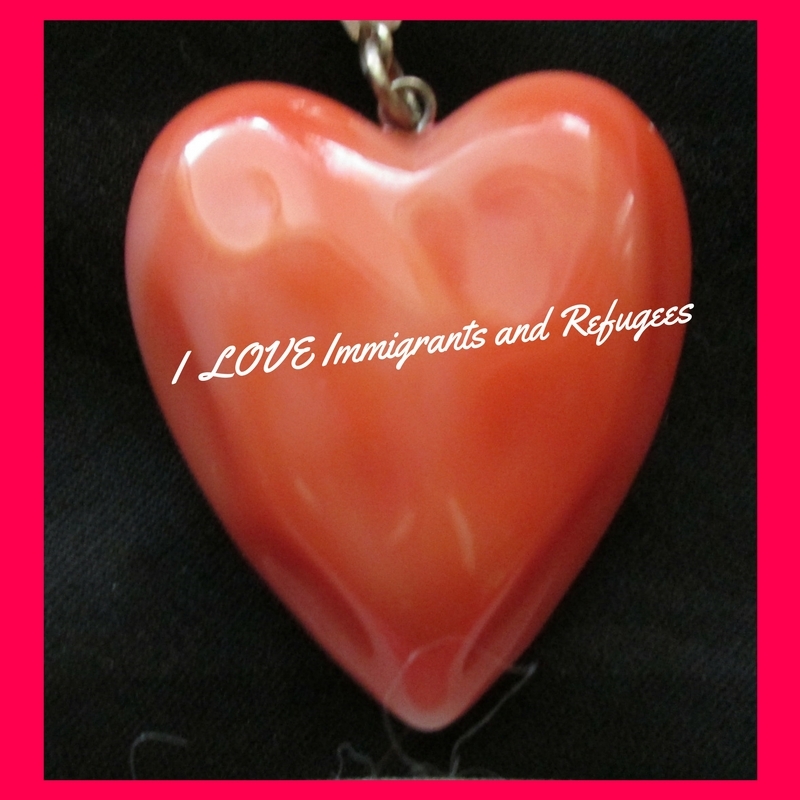 When I look at politics in the USA today, I see us humans fighting to keep our separateness. Instead of love, support, and acceptance of others, I hear leaders proposing control and division. I hear FEAR dominating their conversations and proposals and ego-driven ambition pushing their own agendas. To me, this is the old way of thinking. We humans have thought this way for thousands of years, and look at what we are doing to ourselves and the planet because of this way of thinking. To me, this way of thinking is NOT WORKING. The other piece to this is that when we work together, I believe, we can conquer just about anything. That may mean that I (we) compromise with others, even if I (we) think I am (we are) right. I (We are) am not alone on this planet; I(we)need to consider others. Since this is the time of year that is about being thankful, loving, and kind, I wanted to show you some of the graffiti where I live. Now, if we could only do this! It is hard to walk in some else’s shoes, and fear can stop us. More recently, I got to witness now fear was stopping me for doing the right thing for myself. It was not about the other person, it was about me! I needed to trust myself. Last summer on another walk I saw these hearts, they extended past what I could capture on my camera. I LOVE the message. Skip the Yellow Brick Road, take the path of hearts. The more I seem to feel what is happening in my heart, instead of my head, the more I feel all together. It could be joy or sadness. It is great not to be numb! Great to be fully human! 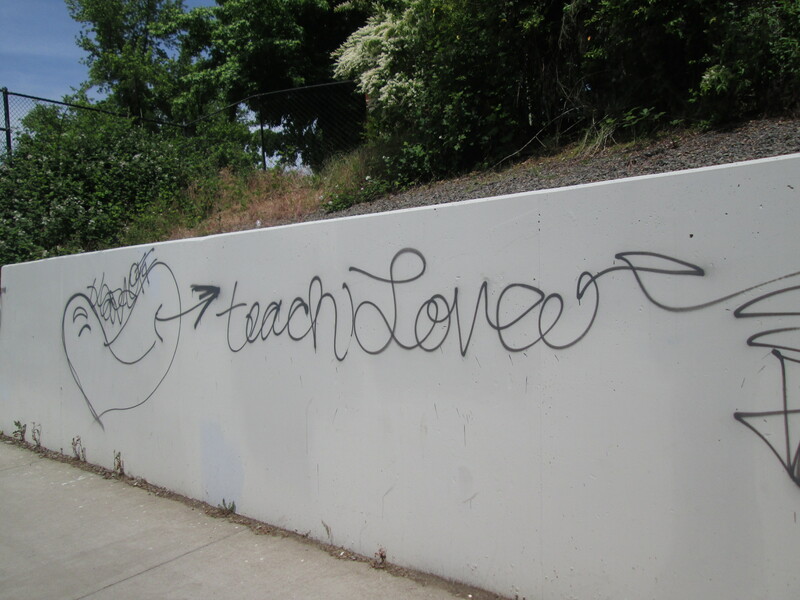 This graffiti touched my heart as a teacher. Can you imagine what kind of world we would live in if we were able to teach LOVE. Love is a choice. 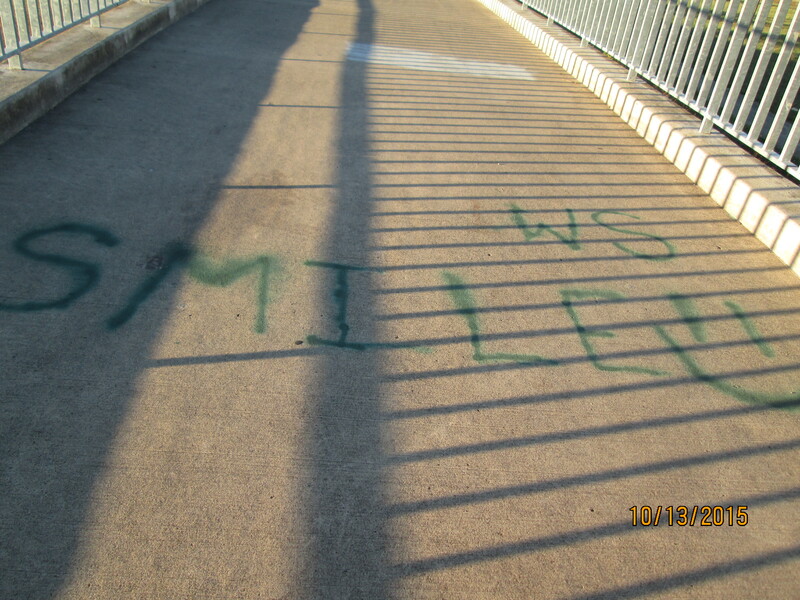 Since I took this photo back in May, this graffiti has been painted over. 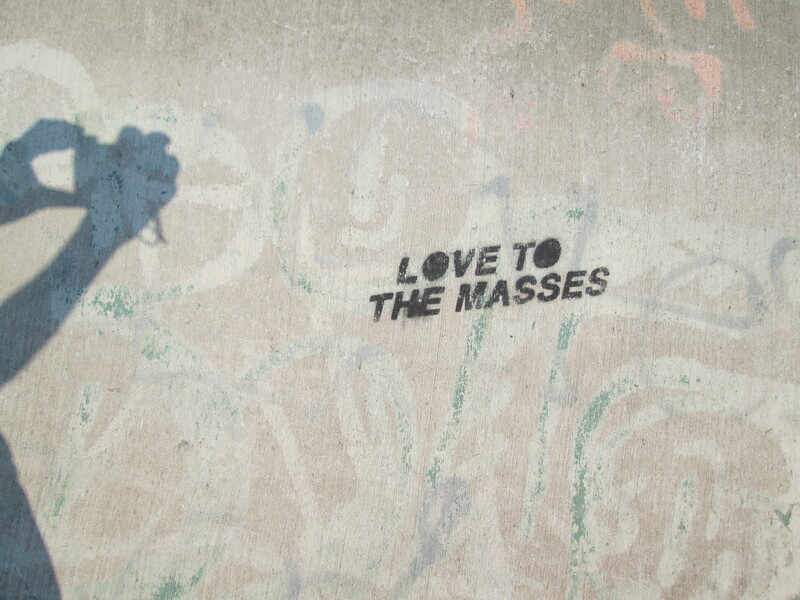 Some graffiti with loving messages, I feel we should let stand. However, I do NOT work for the city where I live. 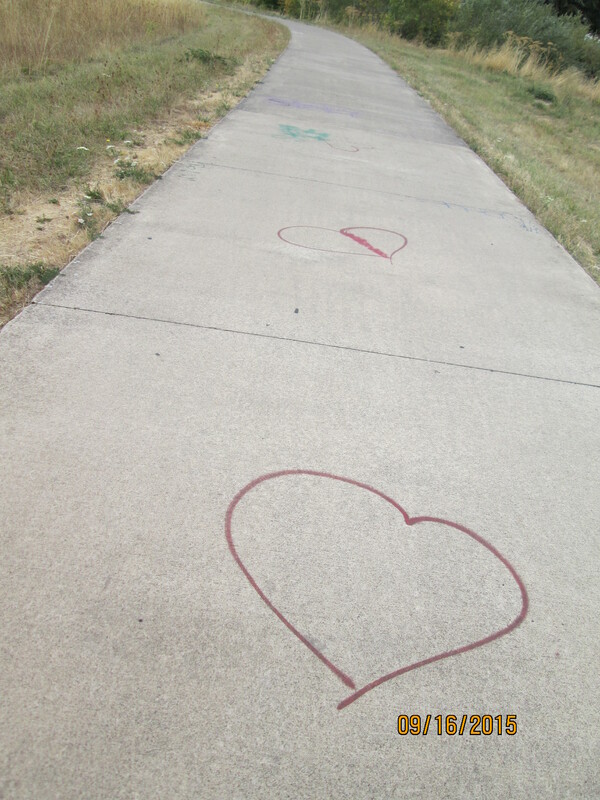 We may have the same graffiti artist to thank for this sign as well as the hearts that on the graffiti 2 “hearts on the path”. This is in a different area. Smiling I consider an act of kindness to self and others. Years ago I had a teacher who told me that when you smile you trigger two points in your forehead that increase your immune system. It is no wonder that I always feel better when I smile. 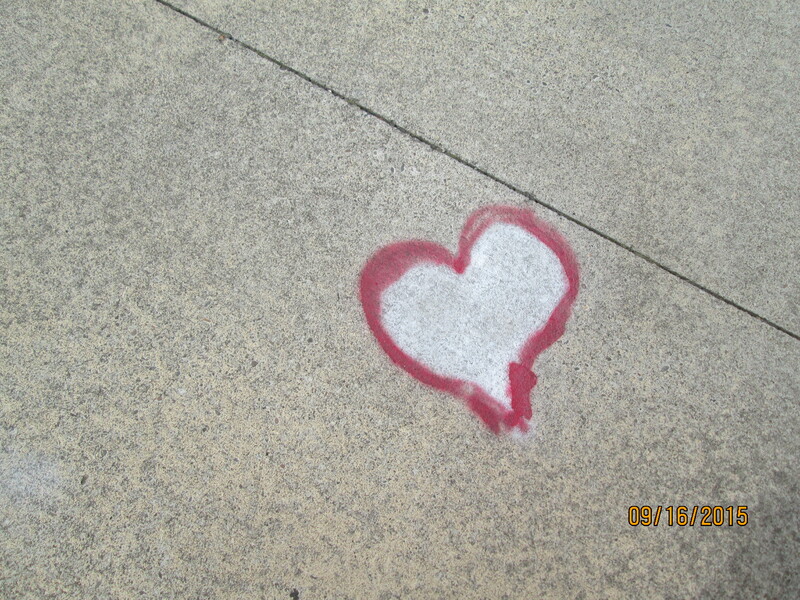 This heart was not far from the “hearts on the path” graffiti 2. I leave you with this heart to try to remind myself and you who we could be during this season of stress, irritation, and LOVE. Here’s hoping the LOVE overrides the stress and irritation. We have a choice about this, too! Smile! When I have to sit in traffic behind someone or am in a parking lot and I see a bumper sticker I like, it can change my mood and give me pause to think. 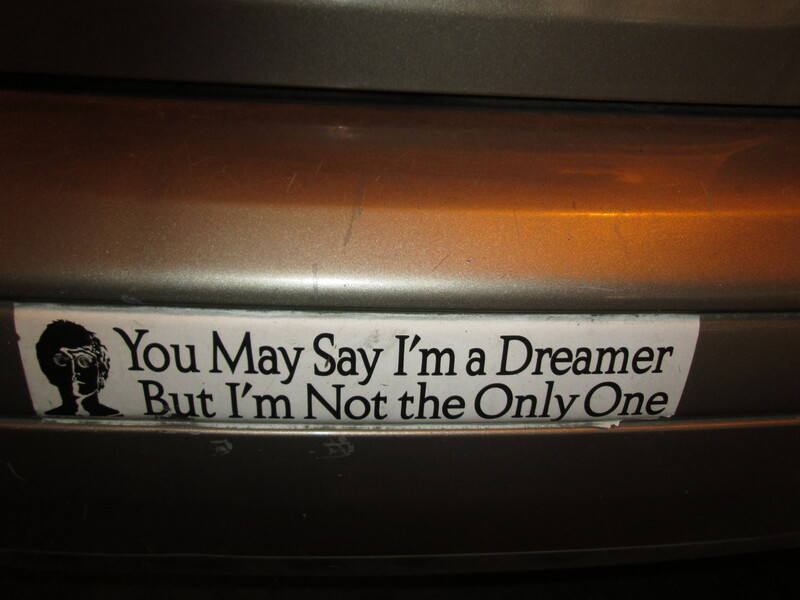 I like bumper stickers like that, and I thank the philosophers who put them on their cars. 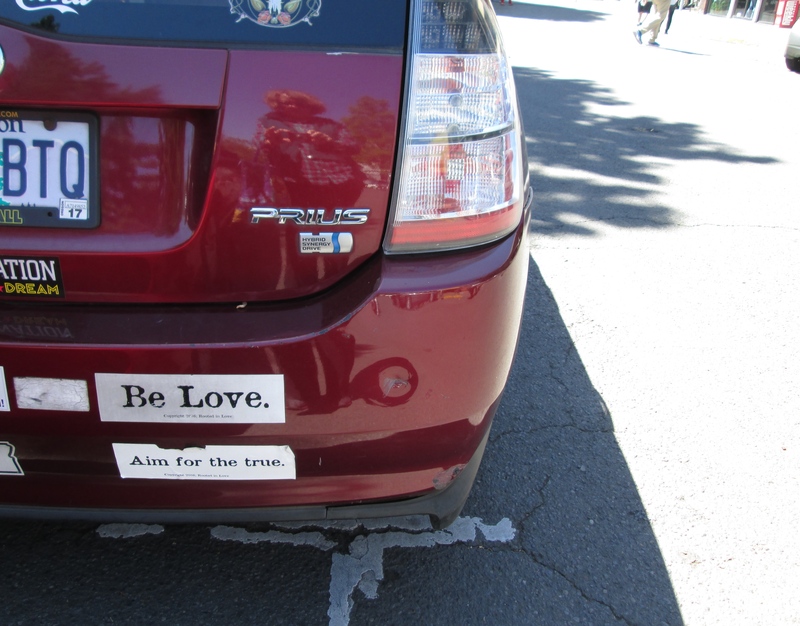 I “loved” these two bumper stickers because they state basic values that make sense. Living them in our daily lives is a greater challenge. It is always good to have a reminder to be our better selves. Where I live there are farmers and farmer’s markets close by. I am very fortunate to have access to high quality food. Therefore, these two bumper stickers say it all. 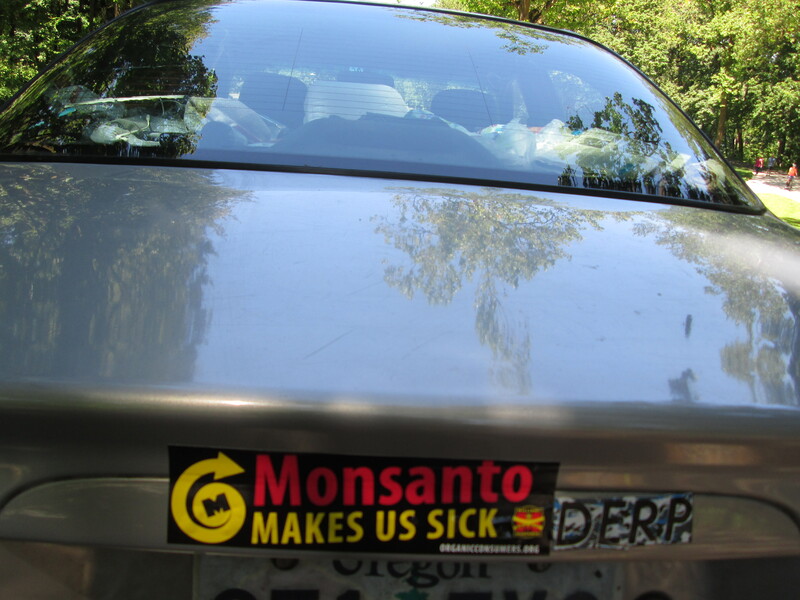 This bumper sticker is referring to the GMOs that Monsanto Corporation puts in the seeds they sell. Several states in the USA are trying to require labeling of GMOs because we still do not know for sure if they make humans sick or not. Seeds that have been genetically modified do require more toxic spraying-yuck! I liked this one because it is mysterious and astronomical with a touch of spirituality. This one makes me scratch my head and wonder. 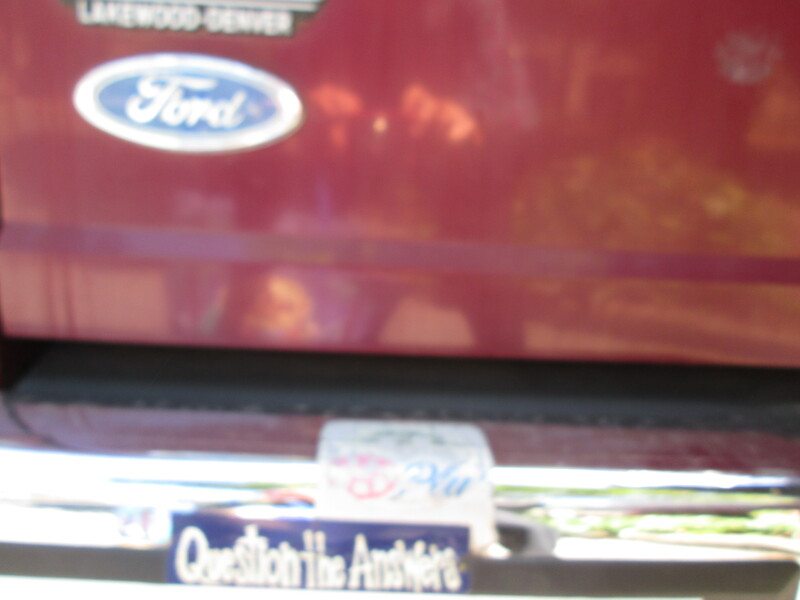 This bumper sticker is a little out of focus and says “Question the Answers”. When I googled “Bumper stickers and TED talks” I got this AMAZING TEDX talk that made me question whether I ever want to use another TED talk for this blog. It is also a good example of “Question the Answers”. Check it out. Benjamin Bratton is a philosopher and designer who has questioned what we are doing with TED! TEDX talk appears at the end of the article. I love the song “Imagine” from John Lennon. I sang it with the first Japanese students in the USA that I ever taught before I became a teacher professionally. I love the words of the song anyway. 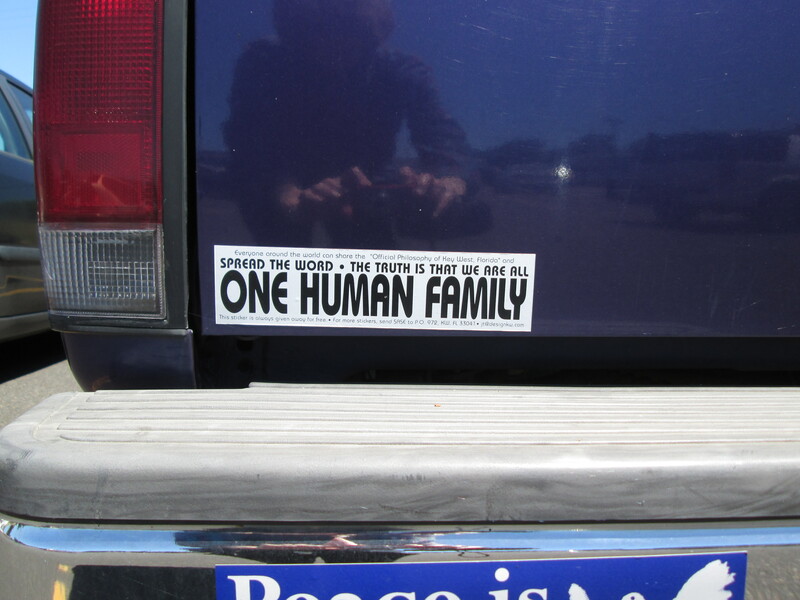 I chose this to be the one “peace” bumper sticker in this blog. 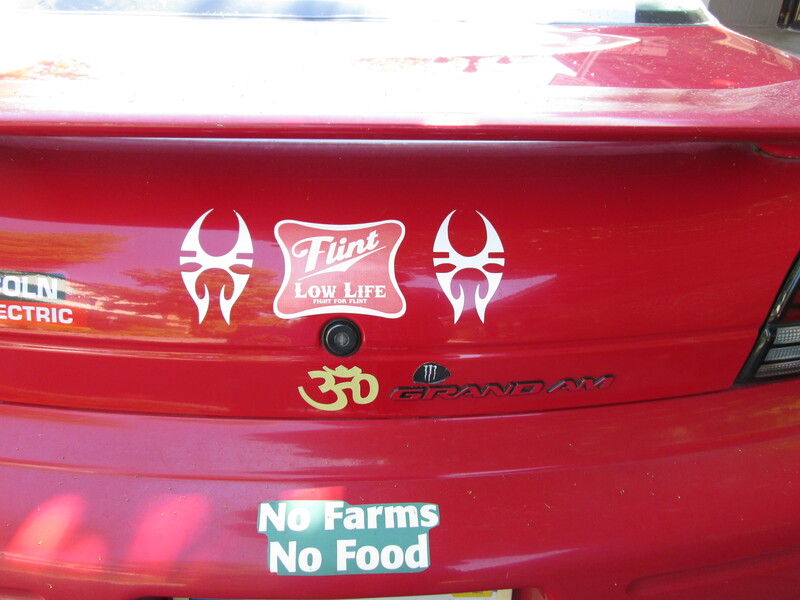 This is was the last bumper sticker I took a photo of. The car was in a parking lot. I talked to the owner of the truck that it was on and thanked her. This is one of my favorite messages- if we could only get it and live it! 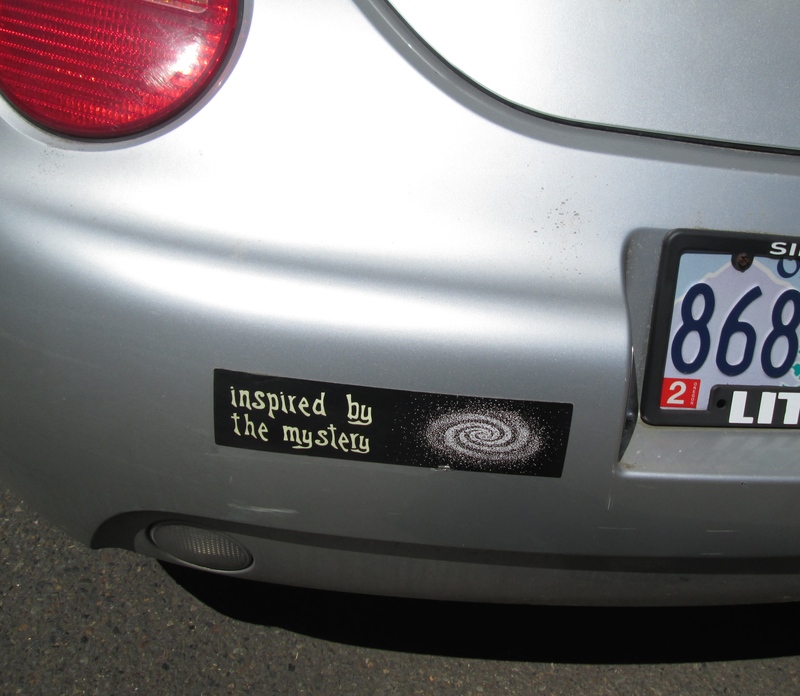 My thanks to all of the bumper sticker philosophers! I’ll be happy to continue driving behind all of you!